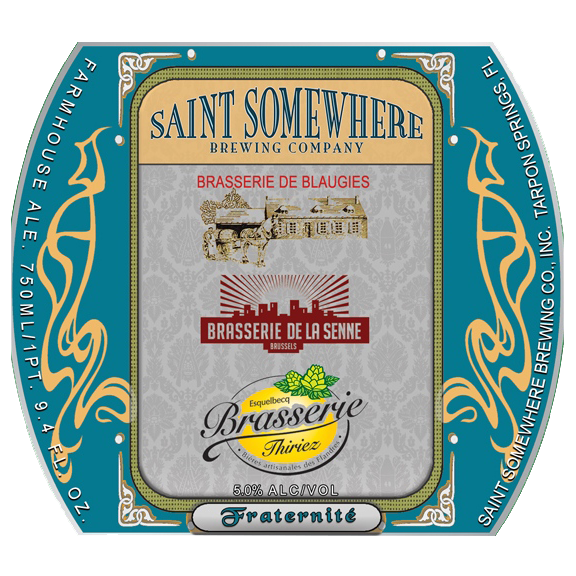 “Daniel Thiriez, Pierre-Alex Carlier, Kevin Carlier, Yvan De Baets, all heroes of Saint Somewhere Brewing, and torch bearers for traditional Farmhouse Ales found themselves at our little brewery. Turns out, Yvan is a bit of a hop-head. Daniel and Pierre-Alex discussed their stocks and Kevin is pretty handy with a mash shovel. At the end of the day, everybody had a turn or two shoveling, we ended up with a nice hoppy Farmhouse ale and the guys all like Greek food. On top of a great beer, we now have a great excuse to take a few more “business trips” to Belgium and France to visit our fraternity brothers.